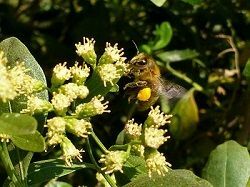 Sunday, October 14, 2018, 1–2:30 p.m.
Master Naturalist Jay Falstad will share his expertise of honeybees and solitary bees with the entire family. Get a close-up look at bees through an observation hive, and learn how bees pollinate the foods we love to eat. You won’t want to miss this program!